Note: Dental Oncology services are normally seen at our Boston office, but can be scheduled for Somerville if requested. A diagnosis of cancer is a powerful, life-changing experience, one filled with seemingly endless visits to doctors, treatment plans, and a long battle to regain control of your health. The good news is more cancer patients are surviving than ever before. As great as that is, it also creates new challenges for the medical – and dental – community to treat the many short and long-term side effects of cancer treatment, as well as provide adequate and appropriate aftercare. Great Hill Dental offers state-of-the-art specialized dental care for patients who are fighting cancer. If you, or someone you know, has cancer, please call us for more information. We look forward to helping make the journey less burdensome . Dental oncology is highly specialized dental care, including management of the soft tissues of the mouth and for oral side effects specific to cancer therapies. The dental oncologist is dedicated to promoting the overall health and the well-being of the patient for each stage of the fight against cancer. A dental oncologist will communicate with your medical oncologist, working as a team to make certain your oral care is effectively managed, with a focus on prevention. 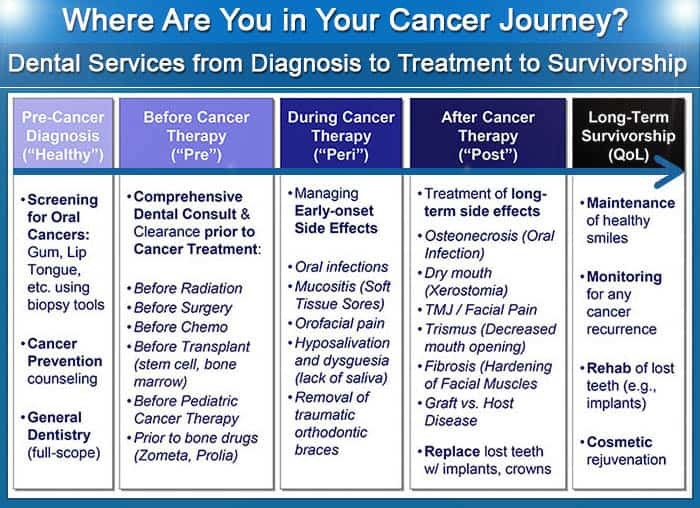 If treatment is necessary, your dental oncologist is trained to provide safe, effective treatment with an understanding of the unique concerns a cancer patient may have when receiving oral care. Because most dental oncology patients don’t have oral cancers; many have breast, prostate lung, GI and other common cancers that have dental and oral implications. Most types of cancer can present with a host of cancer-related dental problems, including radiation-induced oral complications (xerostomia, osteoradionecrosis, bisphosphonate-related osteonecrosis of the jaw) chemotherapy-related manifestations, oral (pre)cancerous lesions, and surgically resected jaws. Many dentists refuse to treat cancer patients with these conditions due to the increased risk of complications that can occur for patients undergoing various cancer treatments. The specialized care provided by a dental oncologist minimizes the risks, while providing the treatment needed. When to see a Dental Oncologist? If possible, your dental oncologist should see the patient before cancer treatment begins. Understanding the overall condition of the mouth and soft tissues can help in formulating an effective plan to manage care during cancer treatment. If treatment has already begun, it is still important to see a dental oncologist as soon as possible, for assessing the current state of oral health and providing treatment if necessary, minimizing future risk of complication. We are deeply committed to addressing the unique oral and dental needs of patients tackling various types of cancers: breast, colon, GI, head/neck, kidney, lung, oral, prostate, and thyroid cancers, as well as leukemia, lymphoma, and other blood tumors. Our team specializes in the prevention, management, and treatment of dental and oral side effects. It is important that you visit us for a consultation as soon as a cancer diagnosis is made.